Or rather, I was going to write about this, but it was going to be a little blurb at the end, not the main subject of my post. Above is my new fun tool, a leaf vacuum mulcher. 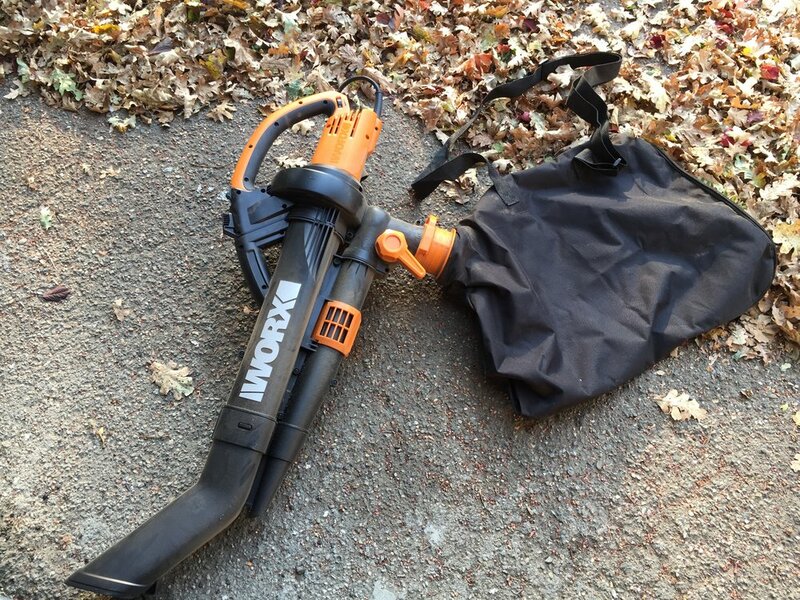 Yep, you read that right - it vacuums up the leaves rather than just blowing them around! Then it shreds them into tiny little pieces and spits them out into the collection bag. Those shredded leaves can then be added into your compost! I got it for $65 on Amazon, but the price has now raised $20 for some reason. It’s still worth it. Plusses, besides collecting and shredding your leaves: It’s electric, it’s not too heavy, and it’s simple to put together and use. Minuses: it’s LOUD, and it can’t handle any branches larger than a pencil size, so using this over wood chips is probably not a good idea. Since I only collect the leaves on my driveway and sidewalk, that’s not a problem. And apparently it doesn’t do so well with wet leaves (very rarely a problem here in dry dry dry CA). But I think this thing is going to save my aching hands, and on top of that provide a whole lot of goodness for the compost pile and the chicken run. But as exciting as this new tool is, this wasn’t going to be my blog subject. Rather, I was planning to write about the field trip I took today with my Nursery Mgmt class. We went to visit Dark Heart Nursery, which grows and sells cannabis clones to the cannabis-growing industry. Here’s the thing: I’ve learned a LOT in my classes, but most I’ve already sort-of learned, or read somewhere, or knew the overview even if I didn’t know the details, or had already practiced doing in my own garden. Cannabis is the complete opposite for me. Other than smoking a joint once in a while in my 20’s, I have zero knowledge of it - how to grow it, or how it is grown in big nurseries, or the business side of these things, not to mention the legal ramifications. So I went in to the field trip with complete ignorance and enjoyed learning about the whole process tremendously. Dark Heart has an indoor nursery and a tissue culture lab, and it was a truly fascinating place. I’d love to tell you all about it. However, we had to sign a non-disclosure agreement, so I am not able to say anything else about the place specifically. Dark Heart is one of only a few of the legal, permitted clone providers in California (where cannabis use and growing is legal, but highly regulated), and I learned so much about the business behind it. Tissue culture is not a new practice; many highly sought-after plants are developed in a lab instead of grown from seed. If you remove the meristematic tissue of any growing plant, it can be grown into a clone (remember back to your high school biology: the meristem is either the shoot tip or the root tip, rapidly dividing cells that develop into the plant. They are like the stem cells in our bodies). It’s a way to replicate the plant while keeping it free of disease, which is a huge concern. Cloners/growers like Dark Heart are then selling their starts to large growing establishments who then grow the plant up to produce flowers, which they then sell (along with distillations of flower and edibles made with the flower) to dispensaries, who then sell it on to the customer. Here in CA we are also allowed to grow six plants per person (or is it household? ), so dispensaries also can sell plant starts. Just as I’ve learned that your local nursery sells plants that they get from other larger nurseries, who buy their cuttings from even larger nurseries, there are many more pieces to the chain than I ever knew. And if you add labs and tissue culture to that equation, then there is yet another link in the chain. So if you are buying a 4” plant for $4, you have to think that the nursery bought it for $2, and those nurseries had to buy a bunch of cuttings, or seed, and then grow those plants out; or in the case of cannabis, they’ve been grown in a lab. By the way, the lab workers all have graduate degrees, and that seems to be required, mostly in molecular biology. The myth of ‘a bunch of stoners in ripped shirts growing weed for fun’ died for me today after I heard some of the credentials of the employees. It’s a serious, serious business. That’s about all I can say without violating the NDA. The science-y stuff was really interesting but also seemed like a very boring job, unless you like working in a lab. The nursery was a bit better, but still seemed very repetitive. I guess sometimes desk jobs can seem pretty repetitive too. Mostly what I left feeling was that this was a respectable way to earn a living. I mean, all this stuff happens in grapes and the wine industry too, and those folks are looked to as artists. There doesn’t seem to be much of a difference between that and cannabis, except that cannabis has been only recently legitimized. In other news, we’ve had some interesting bird encounters lately in the garden. It seems that Northern Flickers have moved into our neighborhood and are delighting us with their hawk-like cries. Something that is not delighting me is the newfound knowledge that sparrows, namely song sparrows, like to eat my greens. Yes, I have caught them in the act, several times now. I always wondered why the leaves of my greens looked like they had been torn in half. Oh, well, there is plenty for all of us. 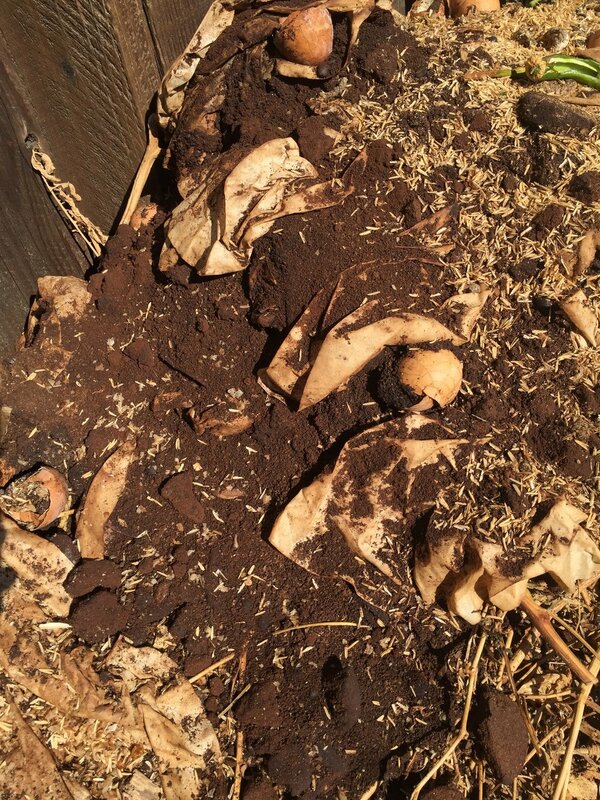 Our composting systems are far from perfect, but they do yield some nice rich dirt a couple of times a year. I have three dedicated compost areas. One is a plastic worm tower with the different levels, and I collect from that every three months or so. The second is a 3x3 redwood bin that my dad made for me, and to which I add worms every other year. This is where all the non-chickeny kitchen scraps go (non-chickeny just means the things that chickens won’t or shouldn’t eat, like garlic peels, coffee filters, paper towels, whole eggshells, etc). I collect a bucket or two from the bottom of this bin every six months or so. The third pile is in the chicken run, and this is where all the yard scraps go - leaves, old plants, stems, etc. I also add soiled chicken bedding here. It gets knocked down by the chickens every couple of days and strewn about and scratched in and pooped in, and then I hill it up again. Repeat, repeat, and repeat. The chickens turn the compost pile for me, in other words. To reach the good, composted stuff here, I have to move all the loose, fresh stuff off the top with a garden fork. Then I can dig down deep and find the gold. I sift out all the big pieces - bark, sticks, and the occasional rock, with a screen Tom made to fit on top of our wheelbarrow. More often then not, I end up balancing it on a garden trug because the trugs are easy to maneuver in and out of the chicken run. It’s a little herky, but I make it work. In the summer, decomposition moves very slowly despite the heat of the pile, because it’s very dry. But still - down deep under the pile - things are cooking. The microbes never stop working for you. They are eating and pooping constantly, aren’t they terrific! And so, I start with this…. … and I end up with this. Enough to fill an entire 3x8 bed. This bed won’t be used until March, when my asparagus crowns arrive. At that point, I’ll dig out some trenches in which to put the crowns, and fill it back up again, and likely will add another layer of compost at that time. Meanwhile, I watered it well and covered the entire surface with coffee chaff, to protect it from erosion, compaction, and the sun. I may not be making perfect compost, but as one of my lecturers (Dr. Stephen Andrews, UC Berkeley Soil Science professor) once said to me, “the best compost is the one you make at home!” Already inoculated with all our good local microbes, and made with our own plant and food residues, which means no waste. If you’re not already composting, I encourage you to find a neglected corner of your yard, and start a pile today. Even if you don’t grow food, the finished product will work wonders on your ornamental garden plants. You won’t need any fertilizer, and you’ll be taking food waste out of the municipal landfills. There is no ‘perfect’ system - whatever you make will work great! My next door neighbors are pretty awesome. Wes and Lavelle have lived in this neighborhood since it was built in the late 40's. They raised their children here, and are a big part of the community. They are often out walking their dog, or stopping by to bring me some banana bread, or helping me identify local trees. Lately the two have had some health problems, and it's tougher for them to get around. So one of their adult sons and his wife, recently retired, have come to live with them. This particular son is in the process of rebuilding the entire length of fence we share, which was built originally by Wes many, many years ago. The new fence is spectacular, and it's a lot of work. I'm enjoying having periodic open spaces in the fence to talk between houses, when Karl (the son) and I are both out working on our various projects. Every so often, Karl and his wife go back up to their property in gold country to take care of things there. When they came home from their last trip, they brought me their worm bin! Karl kept it so he would have worms ready for fishing, but since he's down here most of the time now, that hobby has gone by the wayside. He sees what I'm doing in our yard and knew I would appreciate another way of composting food scraps. So this worm bin is now mine! He didn't just give me the bin, though. He also gave me all its inhabitants - thousands of worms - and the contents of the bottommost tray - the latest worm castings. Oh my goodness, this is like pure gold. Today I spent a good deal of time cleaning these out of the bin, separating the worms from the castings, filling the trays with bedding and old fruit/veg, and getting the bin all set up. The castings went into the containers that hold my Japanese maple trees - what a boon for those heavy feeders, a solid inch of nutrition as a mulch on top of the soil. The worms went back into the top-most bin along with coffee chaff as bedding, and some kitchen scraps. There are four trays total. The top tray holds the worms and waste. As they eat, their excrement (castings) drop down through the tray to the trays below. And any liquid waste goes all the way to the bottom most tray, which has a solid bottom. That liquid is great fertilizer, but it can go anaerobic really quickly, so I just went ahead and filled that bottom bin with chaff to absorb the liquid. 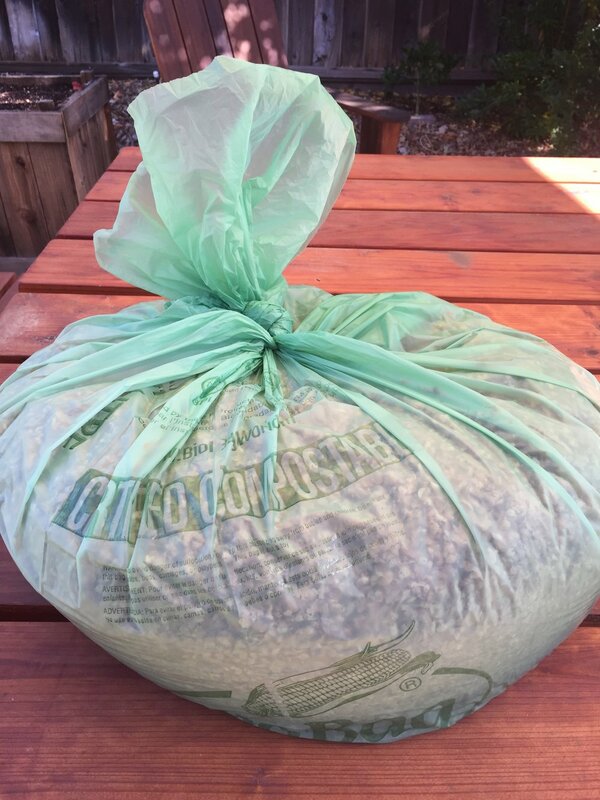 I'll periodically take it out and use it as mulch around my growing plants, and fill it up with fresh chaff. If I used the liquid straight, I would dilute it first (way too 'hot' with nitrogen), but this way it is already semi-composted. As I was going through the sorting/cleaning process, I noticed so many worm egg cocoons. So you know how worms often have that center band around their bodies, looking sort of like a cigar label around a cigar? That is where the eggs develop, and the worm wriggles out of it, allowing it to fold over on itself, and form these lemon-like egg cocoons. The babies hatch and look just like very tiny worms. Worms are both male and female, carrying both eggs and sperm, and they rub against each other to mate and fertilize the eggs in either worm. By the way? Those big white things in this picture? Crushed eggshells that have never broken down in the worm bin, just as we discussed a week or so ago. I'm happy to have another way to experiment with vermicomposting. As you know, I've used my 3x3 redwood compost bin as a sort of worm bin for years. This set up is a more streamlined affair. I'll continue to use both, plus my yard-waste compost pile, which is inside the chicken run. I'm finding that I really cannot have enough compost. I try hard to make all that I need, and I always fall short. Goodness, this is a short list. I just recently planted parsnips in a container, though, and they have germinated. Also, I would say you could continue sowings of kale, chard, and spinach, as long as they are in a protected area (under cover, in containers, etc). Other to-do items for later this month: Prune blueberries and huckleberries, severely prune any California fuchsias (Epilobium or as it used to be called, Zauschneria), prune Caryopteris (must confess I've done that already), and divide any blanket flowers (Gaillardia). Remember how I started to make Hoshigaki over a month ago? I peeled some Hachiya persimmons, strung them up by a sunny window, let them hang there for over a month, massaging them every other day? Well, today they are finally finished. This is exactly how they are supposed to look - like they are covered with powdered sugar. Apparently that IS the sugar, coming up to the surface of the fruit; that's what all the websites say. Personally, I don't think that's what's really happening - I think it's a sort of good bacteria - but either way, this is what the finished product is supposed to look like. We sliced one up and ate it. It's good. Not great - still tastes like persimmons, though not at all astringent. 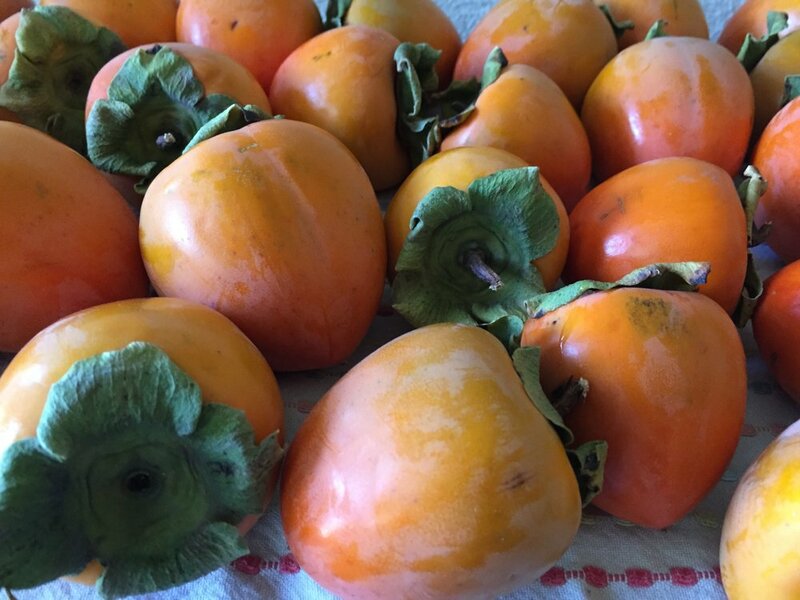 I guess I just don't like persimmons very much, in any form. I suppose these would be good in oatmeal, or baked into a fruitcake (if you like that sort of thing). They are certainly pretty when sliced however. It's another food preservation project that makes your head spin a little. 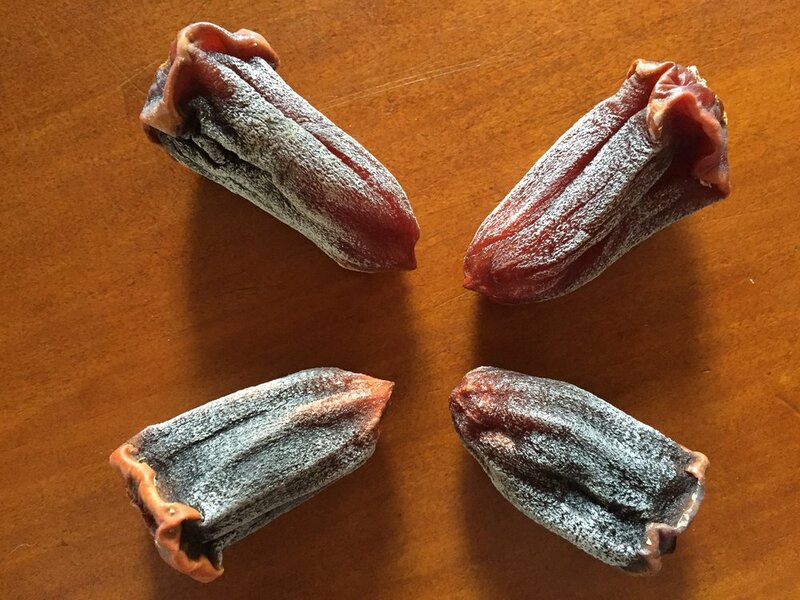 Here's this juicy fruit, skinned and hanging in your house, being visited by fruit flies and such, and you just let it go and eventually it becomes edible again. And probably not just edible, but fabulously good for you, like kimchi or yogurt. My thoroughly Western mind balks though. It just doesn't seem right somehow, like how Tom felt about the country ham. But these are ancient ways of preserving food, that worked for thousands of years. Kinda twists the old noodle a bit. One last thing. I've been learning SO MUCH in class that I want to share with you, about soil, about water, about trees.... it's just hard to condense an entire semester's worth of work into a blog post. So I'll just share tidbits when I can. Here's something I thought was worth passing on: We had a soil scientist from UC Berkeley as a guest lecturer the other night. He was talking about compost etc., and he mentioned that one of his classes did a study on those compostable utensils we see all over the place now. I've bought them myself for big events, thinking that if I send them to the municipal compost facility (in my green can), they would break down, and therefore be a better choice than plastic. Well, this class has had them in a hot compost for over two years now, and they still look exactly the same as they did when they put them in there 24 months ago. So much for them being a better option than plastic. Clearly it's still best to use regular silverware and just wash it. We're having very chilly nights and clear, sunny days. Last night, I wanted to look at the full moon, so I made a fire in the outdoor pit and sat there for a while. We have barn owls nearby; I've heard them before, and a lot again last night. This is wonderful news! What's on your weekend gardening schedule? For me, there's more moving of leaves and cutting down a large privet, replacing it with the Arbequina olive trees I've had in containers for the past two years. Also, HOMEWORK. It's finals time! Have a great weekend, everyone. Like most Americans, I love coffee. I make my own cold brew and have two cups of it every morning, without fail, no matter the season, while Tom prefers and makes it hot every day. Our spent grounds and filters go into our compost, of course, along with tea bags. Several years ago I was touring an urban garden and the owner mentioned that they used a lot of coffee chaff in their raised beds, mixed into the soil. I had never heard of coffee chaff, but filed that nugget away to explore some other time. I totally forgot about it until a couple of weeks ago in my soil class. We had a guest speaker, Alane Weber, who makes extraordinarily high-quality compost which sells for $65 per five gallon bucket (!) and is in great demand. She recommended using coffee chaff in compost, which, even though brown, is treated like a 'green' - that is, high in nitrogen, like grass clippings. I filed that away, until one morning when I was out adding rice hulls to the hen house. I've been enjoying the rice hulls a lot - I'm not worried, anymore, about the environmental price of sand, or the price the addition of sand would cost my own soil aggregation; instead, I'm adding a carbon-rich material which will enhance my soil and also takes a waste product out of the waste stream. But darn it, organic rice hulls are expensive. Not sustainable to my pocketbook! And I'm using more of them than I did of sand, because it doesn't sift like sand did, so I invariably put a lot of rice hulls in my compost along with the chicken manure I am removing from the hen house. Again, good for my soil, not so good for my wallet. So I was musing about that when my brain went *ding! * and I thought, would coffee chaff work in the hen house??? And the answer to that, folks, is yes. Yes it does. Not only does it work, but it smells divine. Not only does it work and smell good, it's excellent for my compost. Not only does it work, smell good, and enrich my compost pile, it's also a by-product of coffee roasting which is rampant here. Not only does it work, smell good, enrich my compost pile, and take something out of the waste stream, it's FREE. There are two downsides. It's incredibly light, so it would blow away in an unprotected area. It's also darker in color, so it's harder to see the chicken waste (which I need to do if I'm scooping it out every day). But those two things are small complaints. I'm not sure it would make a suitable mulch, unless you applied it right before the rainy season, because it would just end up in someone's else's yard. I did some research (and when I say that, I mean I try to find information from universities or colleges, because there is plenty of information on the internet that isn't reliable, I know, shocker right?) and found a very interesting academic paper on the benefits of spent coffee grounds and coffee silverskin, otherwise known as chaff. I think it's worth a read, but if you just want the sum-up, here it is: Both have excellent water-holding capacities, both are high in nitrogen (CN ration of 14-19:1), both are high in cellulose and lignins (i.e. food for microbiota), and both have decent amounts of everything from potassium to calcium. You can read the paper's conclusion for a more scholarly take on this, but in short, this stuff is awesome. 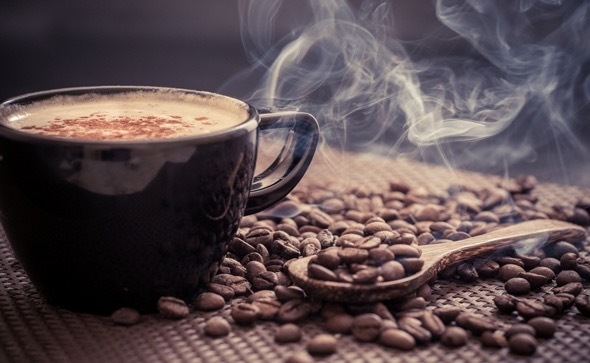 There has been a lot of internet chatter about the acidity of coffee grounds, and they are slightly acidic, but really not enough to do much to change soil pH. Also, the more I researched this, the more I saw possible evidence that the high caffeine content of grounds can actually hurt young plants. 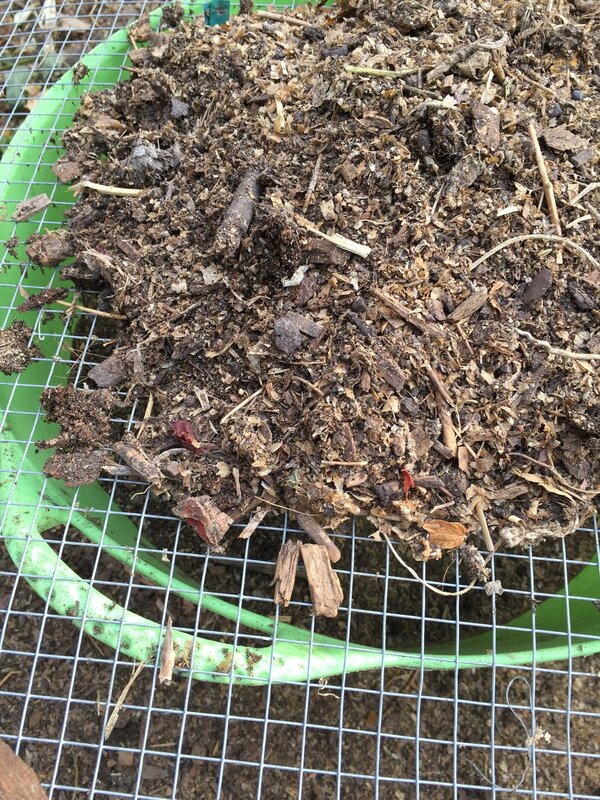 So, I think until there is more solid research on this, it might be best to add these things to your compost, rather than straight into your beds as a mulch. But, speaking of mulch, another fabulous by-product of coffee is those burlap bags the beans travel in. Many roasters are desperate for folks to take these off their hands (though a coffee roaster here in snobby Walnut Creek is charging a huge amount of money for theirs, UGH!). I've decided I'm going to use them as tomato mulch next year. Yes indeed! I'm always looking for a mulch to put around my tomato plants to shade the soil, retain water, and prevent weeds from germinating. So next spring, when I put my seedlings in the ground, I'm first going to cut a hole in a burlap bag, lay it on the soil, and then plant the tomato through the hole. Voila! A perfect mulch that should last the entire season, and can then be ripped up and composted afterward with the vines. I'll probably try this with other plants as well since organic straw for mulch is hard to come by. 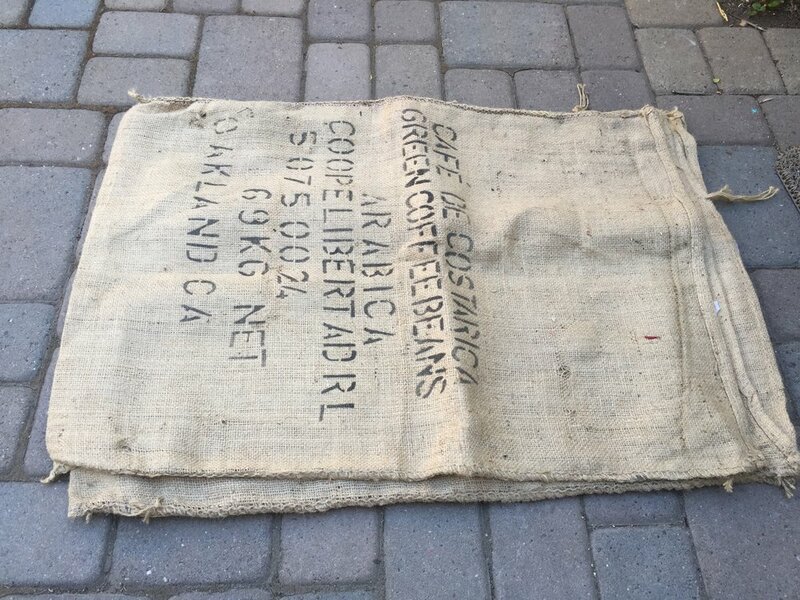 Burlap bags would also make an excellent substitute for cardboard or newspaper in sheet mulch projects. I've used it myself for that purpose, when a smaller area needs a quick fix. You could use them in perennial beds too, before covering with wood chips, as extra weed protection. Also in garden pathways. Endless uses! So, how to get these free coffee by-products? Well, you've got to contact a roaster in your area. I contacted several before I found the right fit. Like I said, the one nearby is selling their burlap bags for a high price, and the owner told me he would not give me his chaff. He declined to tell me why, but that's ok. I moved on to Oakland and Berkeley, and bingo - I found a LOT of resources. Richard at Cafe Santana had a bag of chaff for me, plus as many bags of grounds as I could carry - which were mixed with filters, of course, and also egg shells from the breakfast crowd. He told me I could come back anytime. He had more compost than I could use, so feel free to contact him and tell him I sent you, if you want to pick some up. They do double bag it in plastic, which I suppose they have to do since it is leaky. I would recommend taking your own bins to put the bags in, or line your car with something nonporous, unless you want coffee on your seats. If you just want grounds, your local Peet's or Starbucks likely has bags of grounds they'd be thrilled to give you (not chaff, of course, since they don't roast at their locations). Highwire Coffee Roasters has a million burlap bags they'd love to give you - just contact Julia at info@highwirecoffee.com and tell her Elizabeth sent you. They also have a lot of chaff, but I just made a deal with them to pick up four bags every week, so there probably won't be enough left for you. :) However I am willing to share, just let me know what you need and we'll work something out. Highwire also bags the chaff in compostable bags which I love. Of course you could contact another roaster in the area and develop your own relationship with them, I'm sure there are any number of roasters who would like to have someone come pick up the chaff every week. I'm thrilled to find yet another option for organic matter with which to line the floor of the hen house and even the coop, and to improve my compost, and therefore my soil. I love taking something out of the waste stream and finding another purpose for it. The other day I had a very interesting discussion with a couple of teenaged girls, one of whom was my daughter, in which they were telling me that they often felt helpless about what to do to help the environment. I told them, girls, we may not be able to do big things. But we all make decisions every day about little things, and those are within our control. Do as many little things as you can. Sign up to get email when new blog entries are made. We respect your privacy. We're only going to use this for blog updates. Thank you! Please check your email for a confirmation notice to complete the subscription process.